Burnley boss Sean Dyche is pleased by the manner in which the Clarets are scoring goals this term. The club, now fifth in the Championship, have netted nine times to date with six different goalscorers contributing to the cause. So far defenders have scored four times, midfielders have found the net on three occasions and strikers twice, with six of those goals coming from set-pieces and the remainder from open play. Ahead of tonight’s fixture with MK Dons at Turf Moor, Dyche said: “That is a good marker, every manager would like that. “We’ve got goals from set-pieces, from open play, from good technical moments, they are things you want the team to do. “It allows you at times to win games if you are not at your best or it’s a tight game. Those things give you a better chance and we’ve been productive in many different ways. 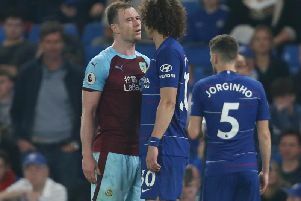 The Clarets go in to the clash with the division’s newcomers in search of their fourth win in succession, but Dyche is still expecting more in terms of performance levels. “I can be hyper-critical at times,” he said. “Three wins in a row is hard to do at any level of football and particularly in the Championship, we all know the rough and tumble of it. Dyche added: “It’s probably a little bit hyper-critical, but I want the team to perform at the top level of its capabilities all the time and I think we’ve got a group who want to do that. They understand when I question them on it and when we de-brief games, they understand what I’m talking about and they’re showing evidence of where we think we can improve. “We think they can be productive and we continue to find the right mixture to win games and the right performance levels. “It’s not an exact science, it’s a flexible science. We’re going along nicely, but we have to keep delivering on every level of what we do.